Award-winning artist Grayson Perry CBE will deliver the inaugural Donaldson Lecture on Wednesday 13 January 2016 at Conway Hall, launching a programme of special events celebrating 175 years of architectural education at The Bartlett School of Architecture, the founding school of The Bartlett, UCLʼs Faculty of the Built Environment. In 1841 Thomas Leverton Donaldson was appointed UCLʼs first Chair in Architecture, one of the first in the UK, founding what later became The Bartlett School of Architecture. A year of celebratory 'Bartlett 175' events begins with the Donaldson Lecture, a major new annual public lecture that aims to draw links between the built environment sector and the wide world. Professor Bob Sheil, Director of The Bartlett School of Architecture, says: "We are delighted that such an original and inspiring public figure will be inaugurating this new annual lecture in celebration of architecture and education, in our 175th year." "Grayson Perryʼs work and his discourse position him as one of the most insightful and provoking intellects of our day. As a school that defines itself through rigorous experimentation and research, we are immensely proud that a figure of such significance will launch a year of events in celebration of our anniversary." The Architectural Review will support the special year of celebratory 'Bartlett 175' events as media partner. AR editor Christine Murray commented: "We are delighted to be supporting this landmark anniversary year and look forward to a series of thought-provoking discussions and events." In February, ʻThink Spaceʼ, a new forum for cross-disciplinary discussion and debate, curated by Bartlett School of Architecture alum Jeremy Melvin, will explore the intersection between art, architecture and neuroscience. In March the School hosts the ʻOpen Critsʼ, a series of all-day crits of student work, with invited critics from architecture, design and the media. April sees the launch of a special publication in conjunction with Architectural Review, celebrating the history of the School and the work of notable staff and alumni. Following the launch the School will host ʻaae2016ʼ a major international conference on the theme of ʻResearch-Based Educationʼ by the Association of Architectural Educators. In the lead up to Autumn, The Bartlett School of Architectureʼs newly refurbished home, 22 Gordon Street, will reopen with a series of special exhibitions and events, including ʻBrought to Lightʼ, ʻThe Big Drawʼ and ʻ80 at 80ʼ, an exhibition of drawings by Professor Sir Peter Cook celebrating his 80th birthday. And in November the School will launch a new international peer-reviewed conference, ʻDrawing Futuresʼ, examining the critical role of drawing in relation to technology, contemporary architectural practice and beyond. In 1841, Thomas Leverton Donaldson was appointed UCL’s first Chair in Architecture, one of the first in the UK, founding what later became The Bartlett School of Architecture. To celebrate this milestone, 2016 will be a year of special events for alumni, students and the general public, including lectures, exhibitions, social events and publications; as well as the launch of a series of Anniversary Scholarships. 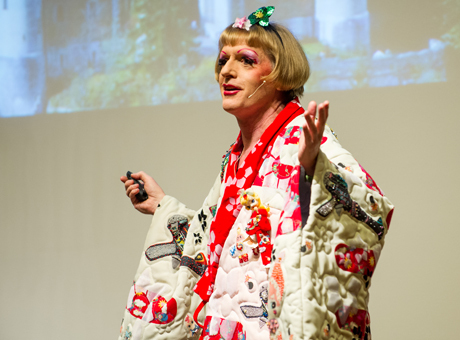 Image: Grayson Perry at the UCL Grayson Gala. Photograph by Kirsten Holst, 2013.